October heralds that season in Arizona when desert-dwellers leave the confines of air conditioning and join the rest of the state in the glorious outdoors! This is a busy month for Rotary Clubs across our district, as we host events like Oktoberfests, Golf Tournaments, Wine Tastings and more! Whether you agree or disagree, social media is an important part of the world that we live in today. It really depends on how we choose to use it. Social media provides a platform for sharing thoughts, ideas and, in some instances, it is a mechanism for change. It has become a communication tool spanning not only cities and states, but countries and continents. For these reasons, it is important for us as Rotarians to embrace this opportunity and use these tools to our advantage. On Thursday, September 21, 2017, the Peoria Rotary Club hosted a ceremony, led by PDG Chuck Fitzgerald, in recognition of the International Day of Peace. 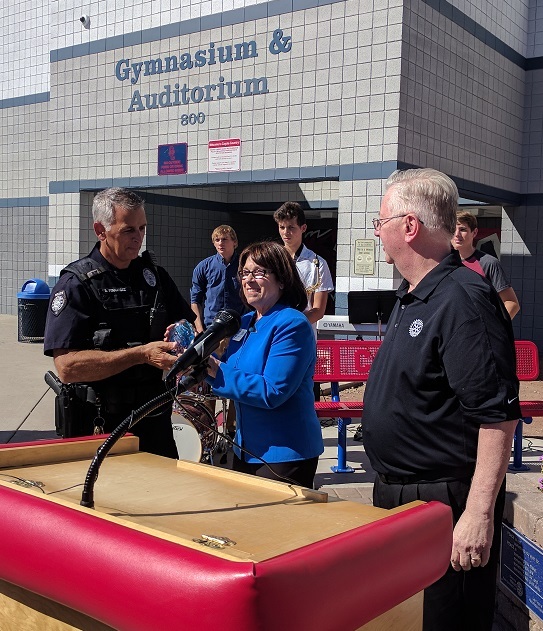 The club's "Peoria Peace Initiative" partners with the Peoria Unified School District and the City of Peoria to encourage conversations and actions in the pursuit of peace in our homes, our neighborhoods, our schools, our city, and around the world. A press release was distributed by the school district to announce the ceremony (see photo). The third-annual Tour De Tonopah will take place Saturday, October 28, offering rides ranging from 13 to 60 miles surrounded by the peaceful desert and beautiful Saddle Mountains. To reach the 300-rider goal, the Buckeye and Goodyear White Tanks clubs are offering $10 per rider to clubs who provide a team of at least five riders. More riders means more funding for your club! September has been off to a good start for our Youth Exchange Students! Over Labor Day weekend, our inbounds and a handful of volunteers and ROTEX traveled to Sedona and the Grand Canyon. 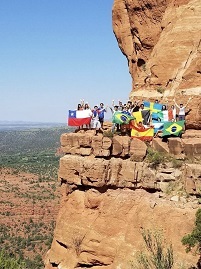 Students hiked Cathedral Rock, participated in a service project cleaning up a local school, networked with Rotarians and explored one of the natural wonders of the world. A big THANK YOU to the Bill Family, Rotary Club of Sedona and Grand Canyon Rotary Club for making this special weekend happen. Led by District Governor Loralli Johnson, our Interact District 5495, with its 90 Interact clubs, will be sponsoring two major conferences this year for Interact and Rotaract clubs. The Fall Leadership Conference is being hosted by the dynamic Interact Club of Barry Goldwater High School in Phoenix on Saturday, November 4. The fifth annual Interact District Conference will be hosted by the Interact Club of Perry High School in Gilbert on Saturday, February 24, and is expected to have a record 500 registrations. On September 5 the Fountain Hills Town Council recognized Four Peaks Rotary and Fountain Hills Rotary for the club's participation in creating the Town's Musical Harmony Park. Fountain Hills received awards from the Arizona Parks and Recreation Association and the "Best Facility" award was given to the musical instrument park. Shown in the attached picture are members of both Four Peaks and Fountain Hills Rotary receiving the award at the Fountain Hills Town Council meeting on September 5. PDG Tonya Watson’s theme for 2016/2017 was “Assist the Elderly,” and District Grants Coordinator Don LaBarge challenged clubs to take part. Mesa West led the charge and 10 other clubs were up for the challenge. Using District matching grant funds, each contributed $1,010. Each club received $510 from the District and matched it with $500. Scottsdale Sunrise Rotary Rascals played in a Miracle League of Arizona (MLAZ) Whiffle Ball fund raising tournament on Saturday, September 9. They played two games to assist MLAZ in raising money for their upcoming season for special needs kids being able to play baseball. The team was represented by: David Ortega, Rosemary Gampm, David Lewis, Mary Holman and Jay, Keith Walter, Duncan Jensen, Barbara Bakwin, Steve and John Clasen, Jake Duffy, Terry Kutzbach, Mike Locher, Craig Rethwill, Neil Sutton, Cindy Weisser, Dennis and Evie Haberer and Maeve from our Saguaro Interact Club. It was a fun experience and a great way to give back to one of our favorite charities. The Steam Bus is Coming! The STEAM Bus will swing into Litchfield Park and will open its classroom doors to the Estrella Rotary Club at noon, October 31, 2018, at our regular meeting in La Bona Pasta Ristorante. This is a fabulous opportunity for all members and friends to see firsthand, cutting-edge STEM educational technologies. 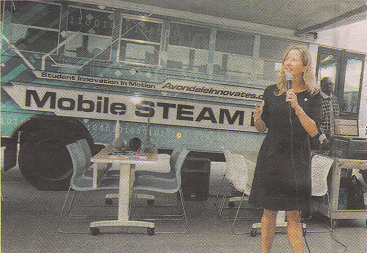 The function of the Avondale Elementary School District Mobile STEAM Bus will be explained by the District's staff. Please mark your calendars and bring a couple of friends. The cuisine is magnifico! Prior to the arrival of STEAM, we will set aside several parking spaces for the mobile classroom. This is one meeting that will inspire the scientist and artist in you. What is Meant by EREY CLUB Recognition ... and How Does a Club Qualify? NOTE: When your club’s Foundation goals are entered in Rotary Club Central, your achievement will be automatically recognized! The Squaw Peak Rotary Club expanded their normal dictionary project this year. In addition to distributing over 700 dictionaries to every third grader at five different schools in Phoenix, they also sent 26 Spanish/English Dictionaries to students in the cities of Sonoyta and Puerto Peñasco, Mexico. This extends our previous projects in Mexico helping an orphanage. Bob Zarling, Matt Rotty, Allan and Polly Cady and Greg Okonowski and his family responded to the call for volunteers to report for work at the Midwest Food Bank Saturday morning, September 9. They helped stack goods to go to Texas the next morning for flood victims. The boxes contained everything from personal hygiene items to paper goods to cleaning supplies. Others were packing boxes with canned goods, water, tea, coffee, and fresh dates. 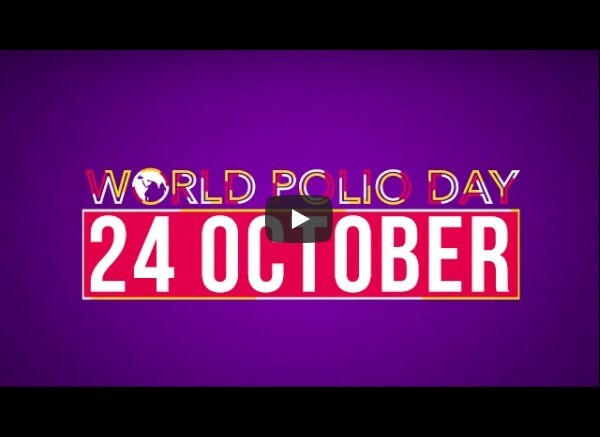 The partnership (Rotary, WHO, UNICEF, the CDCP, and The Gates Foundation) is incredibly close to eradicating Polio, which would be just the second disease to stay permanently in the history books. The Rotary Club of Peoria North will hold its second-annual Peoria North Wine Classic on October 7 at Arizona Broadway Theatre, 7701 W. Paradise Lane, Peoria. 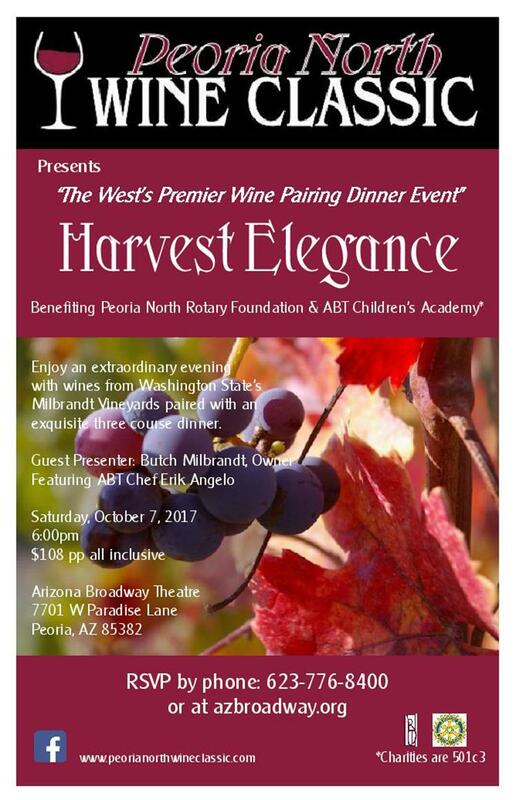 “Harvest Elegance,” billed as the West Valley’s premier wine-pairing dinner event, benefits the Peoria North Rotary Foundation and the Arizona Broadway Theater Children’s Academy. Sedona Red Rocks Rotary rocked local fashionistas with its inaugural Red Rocks Fashion Show on Thursday evening, September 7. The event was held in the Sedona Public Library’s Community Room in West Sedona. Models from seven area boutiques strutted the runway, each showing off four amazing fall outfits. The fund raising event offered a $5 per glass wine bar plus light snacks, and each boutique displayed fashions for sale as well. Two bartending teams comprised of members of Red Rocks Rotary vied for tips from the crowd. Team Nick Hastings and Allen Bradley tromped Team Rick Wesselhoff and Tony Hauserman $127 to $43, with the total of all tips finding their way to RI’s PolioPlus fund. Immediate Past President Denise Dedrick was the vibrant announcer. All 70 available seats were filled, and $945 was the net take. Not bad for a first try – but things can be streamlined for next year. Photo: Judy Arizona located at Hillside Shops in Sedona. Rotarians, family and friends are scheduled to take a five-day Caribbean Cruise March 2-7, 2018, on the Norwegian Cruise Line’s Pearl that will embark out of New Orleans, visit Cozumel and Costa Maya, Mexico, and disembark back in New Orleans. Short Term Summer Reciprocal Exchange opportunities available NOW! Is someone in your club ready to get fired up about Rotary’s incredible summer exchange opportunity for students in your area? What would you do? Become a Youth Exchange Officer (YEO), qualify students and families for participation by making home visits, interviewing students and parents, witnessing signatures and facilitating the process. Help create a summer of a lifetime! Promotional flyer attached. The Rotary Club of Scottsdale holds two Paul Harris Days each year at multiple meeting sites. 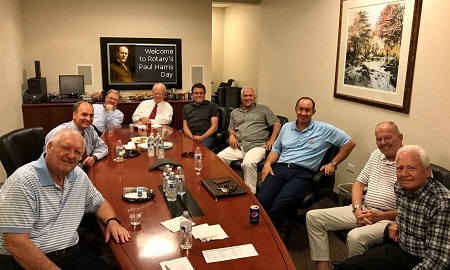 These meetings – one in the fall and one in the spring – are an excellent opportunity for club members to learn more about each other by gathering in small groups, in members’ offices or other locations, just as our founders (including Paul Harris, pictured on the TV Monitor) did a century ago. Paul P. Harris, a lawyer, was the founder of Rotary, the world's first and most international service club. On February 23, 1905, Paul Harris formed the first club with three other businessmen in Chicago. Through Paul Harris's vision of service and fellowship, Rotary has grown to be a global network of 1.2 million neighbors, friends, leaders and problem-solvers who come together to make positive, lasting change at home and abroad. "Rotating" between members’ offices is actually how the name Rotary was established. 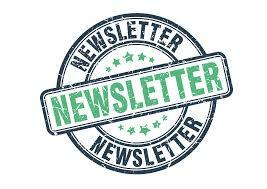 For more information about Rotary Club of Scottsdale's upcoming speakers, projects, programs and meeting dates/locations, go to www.scottsdalerotary.org. Active and retired business professionals are always welcome. Vocational service in a Rotarian’s life allows for the Rotarian to hold high their chosen vocation; to proudly represent themselves with their high level of ethical standards and to share their knowledge with others who can benefit. The broad goal for this year’s Vocational Service Committee is to create greater awareness of the value of vocational service and to encourage individuals and their clubs to utilize their vocations as an opportunity to serve others. 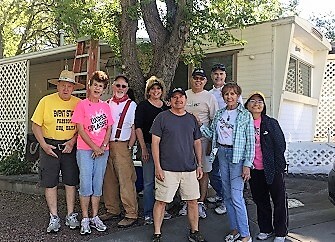 The Prescott Sunup Rotary Club once again came to the rescue of the elderly and/or disabled by helping a woman living alone who was being threatened with eviction. The Coalition for Compassion and Justice (CCJ), an organization with whom Sunup works closely, contacted the club with an appeal to save a woman’s home from being removed from the mobile home park because she was in violation of the park’s paint code. On September 14, Keith Brekhus, the constituent services representative for Congressman Tom O'Halleran, visited the Silver Creek Senior Center in Snowflake for outreach and to listen to the seniors’ needs and concerns. He also shared what the Congressman has been doing. 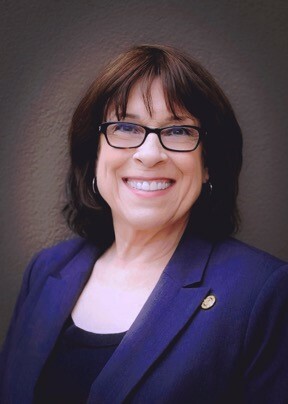 DG Nancy’s annual official visit to Area 17 was a smashing success with 61 Rotarians from the area’s four clubs attending the evening event held at The Collective in VOC Sedona. The multi-club visit opened with an hour of fellowship bolstered by an abundance of BYOB adult beverages. Hearty appetizers filled the attendees’ plates – all from local restauranteur, John Ramagli of J Wine Bistro. The presentations for the evening began with each of the four club presidents giving a five-minute talk about their clubs. It was amazing how composed and concise they all were, knowing that AG Donna Hawk had her timer running. Jennette Bill (Sedona Rotary) and four cohorts from the Verde Valley Imagination Library team gave a brief overview of that program’s success. “Rotary is Rumbling” throughout District 5495 Area One! 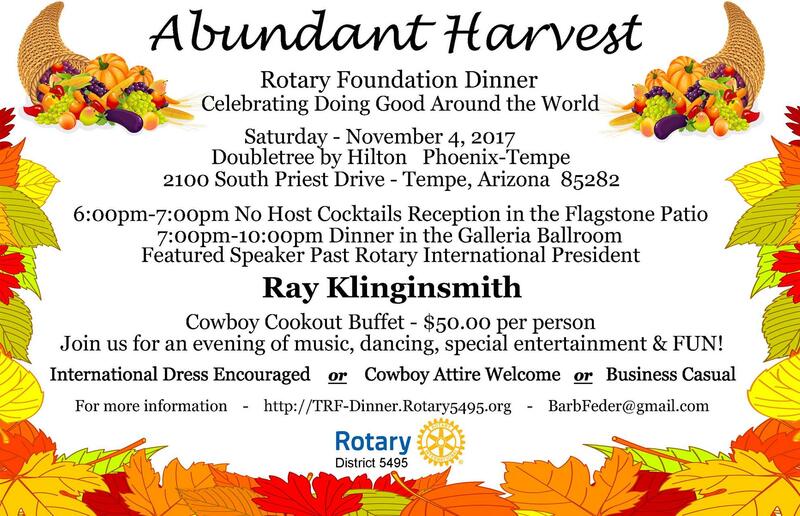 From the Hualapai Mountains overlooking nostalgic Route 66, across a Golden Valley to the mighty Colorado River, “Rotary is Rumbling” throughout District 5495 Area One! We are a group of six clubs, including two satellite clubs, spread out across more than 50 miles. Starting with Kingman, Kingman Route 66 and Route 66 Satellite Club in the southern portion, and 40 miles to the north along the Colorado River is Bullhead City Rotary and, in Fort Mohave, the Laughlin Satellite Club with Laughlin Rotary on the state line in Nevada. Due to article length constraints, please CLICK HERE to download a PDF of the entire article.